Return to a time when the food was local, the service impeccable, and the atmosphere cozy and intimate. 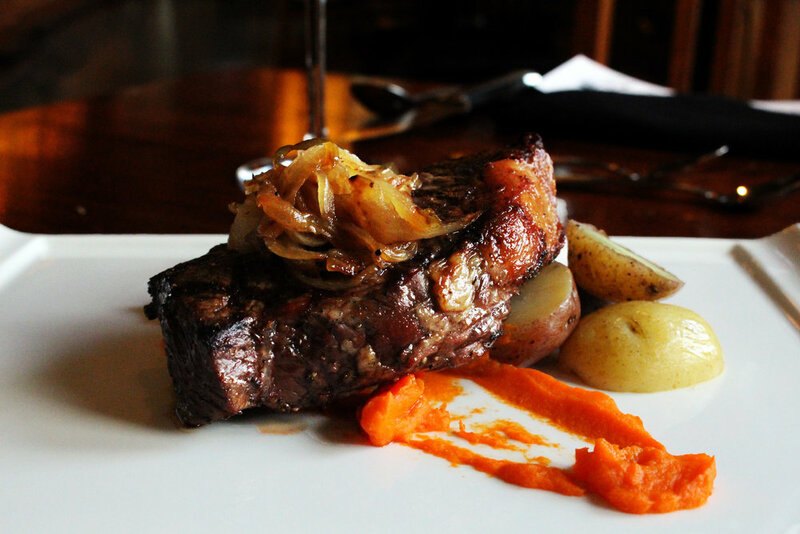 You’ll find all of this at the Selkirk Grille. We’re located right at the front of Heritage Park in Calgary. Find us in the Heritage Town Square free zone, located before the Park gates. No admission fee is required. Enjoy a fresh and inspired menu that changes seasonally, drawing on local Canadian flavour with a strong field-to-fork philosophy. Our chef sources meat and dairy items within Southern Alberta whenever possible, and many of our produce items are grown right here in Heritage Park’s own vegetable and herb gardens. The Selkirk Grille is open year-round. In the summer, the patio overlooks a plaza that hosts a weekly summer concert series. In the winter, diners can enjoy the view from the main dining room, which features a sandstone bar and wood decor. We look forward to welcoming you to our table. Parking is complimentary for the first 90 minutes (pay station registration required). Reservations are recommended, but are not required. Reservations required for parties of 6 or more. We welcome private events for up to 30 guests. Looking to book a larger party of over 30 guests? Visit Heritage Park Catering for more info.